Setter Anastasiya Muzyka, from Poltava, Ukraine, was named as a part of the Canada West all-star rookie team. 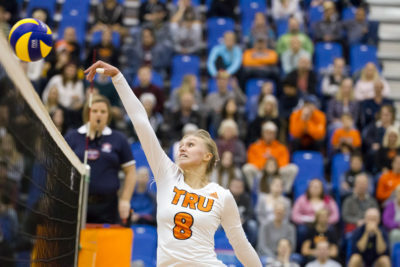 It marked the second year that a member of the TRU women’s volleyball team was named in the squad. Mikayla Funk, (South Surrey, BC) and setter Abby Spratt, (Calgary, AB) made the team last year, with the ’Pack team seeming to be developing a habit of getting a player selected annually. Muzyka played 17 matches, 45 sets, had 344 assists, 58 digs, 24 kills, 10 service aces, 4 solo blocks and 16 block assists. “I was so happy to know that I am a rookie all-star, it’s nice to see the results of hard work,” said the Ukraine native. Muzyka was grateful for all the help she has received from the team. “I am so thankful to my coaches and teammates who supported me throughout the season,” she said. Muzyka is in her first year in the business program after having moved from Ukraine where she played professional volleyball. Muzyka also stated that she regularly sets goals in a season, although she didn’t specifically state that making the all-star rookie team was one of them, it would be easy to surmise that it isn’t far from her thinking. Muzyka has a thick Ukrainian accent, one that can give an impression of an extremely laid-back individual, but the more you speak with her the more you realize she is a fierce competitor. She is very passionate and driven about achieving her and the team’s goals. “Next season I will work even harder to achieve bigger goals,” she said. Muzyka also spoke highly of her teammates and her new environment. “Our TRU team is a good team and the girls are so nice, this has become my home now,” she concluded. Muzyka expressed the pivotal role head coach Chad Grimm has played in her development and her success. “He helped me all the time,” Muzyka said. She spoke of how much help he gave her in settling into a new environment and a different culture. Muzyka talked glowingly about the practices they had in the summer and how they helped her get ready for the season. Coach Grimm, unsurprisingly, was as equally effervescent and impressed with Muzyka and described her performances as ‘great’ and praised her work ethic. Grimm felt her performances improved greatly after the Christmas period, something he believed had to do with her becoming more comfortable and relaxed with her new environment. Coach Grimm stated that having teammates that were helpful also played a major role in her performances getting better as the season went along. Issues such as language barrier, cultural differences and getting used to the team system were also factors that needed to be overcome to get the best out of Muzyka. Muzyka has had an excellent debut season with TRU, with continued dedication and focus who knows what heights she could reach? Only time can tell!